@networkingnerd in other news, my boss told me today that certifications aren't worth the paper they're printed on. Any thoughts on that? Jason, Fernando Montenegro (@fsmontenegro) and I engaged in a little back-and-forth about the relative value of certification. This is something that I do hear from many people, though. Many employers don’t see the value of certification. Some supervisors (like Jason’s) don’t think certifications are worth the paper they are printed on. I have a totally different stance, and not just because of the giant Wall of Shame behind my desk. Next time you run into someone that doesn’t think certifications hold much value, ask them to show your their diploma. If this person is a supervisor or management type, they are sure to happily point out their degree from a prestigious organization. In some cases, more than one. Guess what? In my mind, those college degrees are the same as certifications. I have a bachelor’s degree. I have a CCIE. To me, those are very similar. They both involve a large amount of studying. Both study programs are fairly regimented to ensure the student gains the proper amount of knowledge to successfully execute upon that knowledge base. Both are expensive to chase after. Both are far from easy. It just so happens that one of those taught me how to be a business leader and database admin and the other taught me how to work on routers and switches. In the end, for both of them I ended up with a piece of paper that had my name printed on it that I could hang on my wall as a banner to tell everyone what I had accomplished. One of the smartest men I ever worked with had no college degree and very few certifications. No A+, no CCIE. However, he had an instinctive understanding of the way computers worked and was quick to fix most every problem he encountered. People constantly underestimated him because they didn’t see his diploma hanging on his wall or noticed his Novell/Microsoft/Cisco certifications. I only made that mistake once. That was the moment when I started realizing that certifications aren’t a measure of knowledge in and of themselves. They’re more like merit badges. I was a Boy Scout back in the day. I loved pouring over the scouting handbook and picking out all the merit badges I wanted to earn. You might even say it was an early precursor to what I’m like today. I found it interesting that I merely needed to demonstrate my knowledge about a subject and the scouting organization would give me a little badge or pin that told everyone I knew how to make a campfire or pitch a tent. 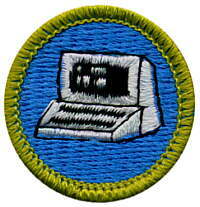 Whenever I encountered another person with that same merit badge, I knew instinctively that person knew as much about the subject as I did. I didn’t have to wonder if they knew the ins and outs of something they had a badge for. That’s what certifications do for you. They give you a little badge you can put on your resume so you can announce to people that you know a certain amount of basic information. If you are an MCSE, I know you are familiar with Active Directory. If you are a CCNA, I know you know what a router is. If these certifications are so great, why would an employer be hesitant to want you to get one? I did some thinking and asked a few people and I could really only come up with a couple of reasons. The first involves companies that aren’t focused on things like value-added reselling. These companies might be manufacturers or law firms or schools. They don’t resell their IT services to others but instead consume them in-house. To these organizations, what you know is more important that telling someone what you know. So long as you are familiar with setting up Exchange or configuring a floating static route, who cares if you took a test to prove it? These types of companies typically gain little for paying to have someone certified. They also don’t see the value in the learning process toward certification. So long as you can do your job effectively, learning more than is needed isn’t necessary. I would recommend finding ways to prove that certification can reduce costs or provide extra value for the company as an incentive to get funding or time off for study. Also, don’t underestimate the potential increase in prestige for employing a higher-caliber technical person. Some companies treat prestige like a currency. The other major issue with employers when it comes to certification is fear. This is usually manifested by the idea that the employer doesn’t want you to pass any tests because they are afraid that you’ll jump ship once you’ve become a CCNA/CCNP/CCIE and leave them holding the bill. Especially in the VAR space, employers become squeamish if they spend a lot time training someone only to have a competitor swoop in and offer a premium to hire that person away. The competitor gains a highly trained resource for a pittance compared to the time and effort of training them. If these types of employers do decide to fund your studies, they will typically do things like have you sign a contract for a length of time or agreement to pay back a portion of the training and certification costs if you decide to leave. These types of things can be hard to combat. If you aren’t willing to go the route of certification totally on your own, you may have to sign the agreement or otherwise convince your employer of the benefits of certification. Just ensure that if you do have to sign an agreement that the clock doesn’t reset for every certification passed. I’ve heard of people that kept re-upping for a new term with every test passed. The bill to get out of that contract wasn’t pretty. When I first started working for my present employer, the owner interviewed me and said, “Boy, I’m going to put a quarter of a million dollars into training you to be the best.” Almost eight years later when I passed my CCIE, I asked him if he’d hit his quarter of a million yet. He laughed and replied, “Long ago, son. And it has been worth every penny.” I’m fortunate that I get to work with people that understand the value of certifications. It also helps that I work for a VAR that wants to show them off and use them for competitive advantage in the market. The next time someone tells you that certifications are a waste of time, ask them where they graduated from, especially if it’s a college. Explain to them that a certification isn’t any different than a college degree and confers a similar level of knowledge, albeit a little more focused on one area than a general education degree. Then remind them that the diploma hanging on their wall is worth the same amount at the paper your certification is printed on. Just don’t ask them how much they payed for their paper. I’m sure you got a better deal on yours. This entry was posted in Certification by networkingnerd. Bookmark the permalink. I guess it all depends on what you want to do – if you love hands-on, then certifications are big help. If you’re more into design, architecture, innovation – then you may be hard pressed to find certifications that reflect what you can do. You make a valid point in comparison to college degrees. The amount of effort and investment to get a certification/degree are very similar. You can say the same for accounting certifications. Pingback: Certification – Earn It, Don’t Just Pass It! I work for a very small company. My official title is “Sales Engineer”, but I’m definitely Sales first with Engineering as a very distant second. My boss is in Tom’s first category and only cares that I know the technology and doesn’t really care if I have the credential to prove it. His reasoning is that I need to be able to talk to customers, understand their systems, and ultimately sell our products/services. It’s my commission on the line and if I want to make more money then it’s up to me to learn this stuff and do certifications on my own time. My boss is also in Tom’s “fear” category as well. He doesn’t want to train me if he’s not going to recoup his money. Additionally there’s a third category that I like to call “Lack of Respect” for certifications. My boss is a huge proponent of this one. In his mind, he sees too much emphasis placed on certifications in the job market and therefore people will find all kinds of ways to cheat on certification tests. Basically he doesn’t trust people that only have certifications, especially people that have a lot of them. He’d rather see a college degree and experience backup a resume. I can’t really fault my boss for his beliefs since he’s probably been burned by bad employees who were great on paper. Regarding all of this stuff, @fsmontenegro probably gave me the best advice: “Certs are your own achievement. Unless req by partner or training plan, do it on your own.” I totally agree with this. I’ll continue studying on my own time and keep taking the tests. I’m in it for the knowledge because when I talk to people like @networkingnerd, @networkjanitor and @the_socialist I want to know what I’m talking about (hopefully I’ll get there someday). I’m not really in it for the alphabet soup on my resume. Thanks for the very interesting post. I’m very much in-line with your thoughts on the value of certifications. My main concern with certifications is the dilution of their worth by the people who actually do just treat them like merit badges. If people just cram to get the letters, but can’t actually deliver, then the certification will be become devalued. Great post and a very interesting discussion! I think your comparison of certification to college degrees must stem from a narrow familiarity with vendor certifications out there. I am not familiar with the CISCO ones so I cannot comment on them, your comparison might hold for them, but I am familiar with various Microsoft certifications and a college degree they are not. I’m not saying that they are all easy but some don’t require much effort at all and by that I mean a weekend cramming will allow you to pass an exam. I’m skeptical of certifications because of my experience with M$’s certifications. Red Hat has it right, but their exams are a lot harder to set up and mark, which is probably why hardly any vendor deviates from the multiple choice exam. I also have a colleague that has no certifications, college degree or even A-Levels (High school diploma) but his breadth and depth of experience as well as sharp thinking make him a great asset.